Wedding Wednesday - Bridesmaid Dresses and Colors Finalized! Happy New Year. Today is the first day of 2014, the year I will become a Mrs! SO much has been accomplished since my last Wedding Wednesday post. In fact, I am having a hard time keeping up with everything I need to blog about. The biggest to-do's we crossed off the list was deciding on our wedding colors and bridesmaid dresses. While I stated all along that I was dead set on slate grey dresses for the girls, it just didn't seem right once seen in person, especially against the Jackson Square backdrop - the girls would have blended into the scenery. I also believe my biggest frustration in choosing colors was having grey as the main color. 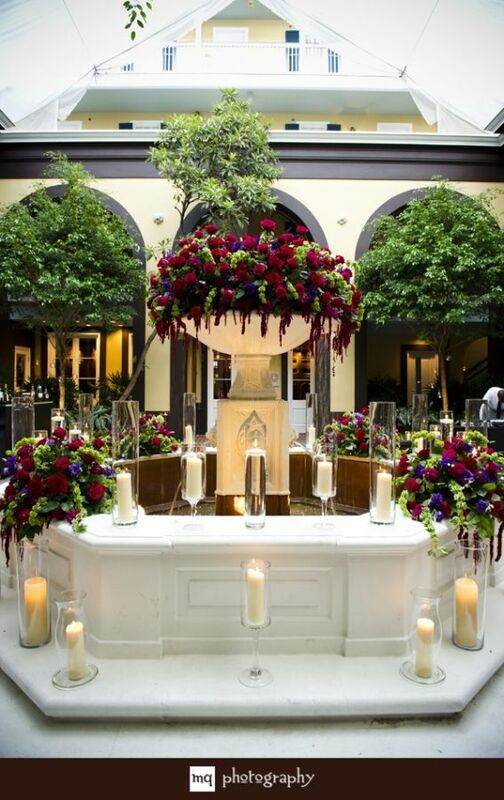 Ironically the very first wedding image I pinned, well prior to getting engaged was of the fountain below. Something about the colors and the elegance of this photo made me fall in love. More ironic, I pinned this photo before touring Hotel Mazarin, where we are having our wedding reception. The first pinned photo happens to be the fountain located inside of Mazarin and our cocktail party will take place in this very spot. Looking back at this photo made my decision final - selecting plum and burgundy as our colors with hints of sliver/grey and black. 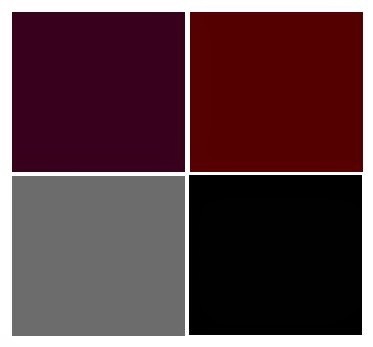 While a friend of mine joked and said that my color scheme reminded her of the red hat club (funny actually), I feel the colors scream New Orleans and if done right, deep purple and deep red are gorgeous together. The red hat club ladies are on to something. Bridesmaid Dresses! It took me 6 times as long to finalize a bridesmaid dress as it did for me to purchase two wedding dresses of my own. The dress I chose was Bill Levkoff 747 in plum. The computer generated image shown below is a tad bit darker than the actual color. This dress is very similar to the first bridesmaid dress I pinned but in a different brand and a much better fabric. It's gorgeous on and will look fantastic on all the girls! 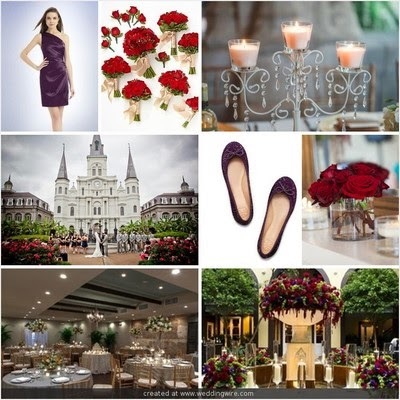 Here is a copy of my inspiration board with our ceremony location, reception venue, cocktail hour location, centerpieces, flowers and my shoes (the girls will be in black heels) I am pretty happy with how everything is coming along and if I went with my first instinct on colors and dresses, I would have saved myself a great deal of time! If you are married, what was your hardest decision to make in wedding planning? If you are unmarried, what do you think your hardest decision will be? Yes! I'm so glad you went with the plum! My hardest decision with wedding planning was where to go for our honeymoon. Not even kidding, lol. Thank you and I am too. Honeymoon is a whole different story as I am trying to plan a monster Europe trip on a budget. FUN. Wahoo! The plum is much better than the gray (in my opinion). My hardest decision apparently was the date. I changed it several times. But, I've been married over 50 years, and weddings weren't quite as complex as today. We had a small wedding, my best friends were the bridesmaids, my husband-to-be's best friends were the groomsmen. My bridesmaids selected their own dresses in colors that suited them. My dress was an off-the rack chiffon and lace tea dress - found in one trip. The reception was a dinner at a local restaurant. All worked out easily ... but the date ... whole 'nother story. Joan, I owe changing from a grey color scheme to you! I was so set on my grey dresses until your original comment and it got me rethinking the entire scheme. So thank you!! HAHA I still laugh at that comment of yours!!! Thank you though, I am loving the scheme now that it is finalized.